This week’s VIDEO PICK features Frame Dance and was so inspiring to me, especially when someone said “Art should be part of our every day lives.” As I move through the grief of losing my mom recently, I am realizing more and more how I turn to art for comfort, for expression, for community, for healing. I, too, believe that it’s important that art is present in our lives on a daily basis – in fact, that’s the main reason I starting writing GISH PICKS in 2004: to encourage ya’ll to get out and explore Houston’s many amazing and dedicated arts groups! Frame Dance is doing their darndest to bring art to everyone – and this week, they’ll be surprising METRO riders with dance moves! They’re bringing back their “Metro Dances” this Saturday, March 30, from 5-6:30pm – after the dance you can meet them for dinner in midtown and a stop at the Continental Club. 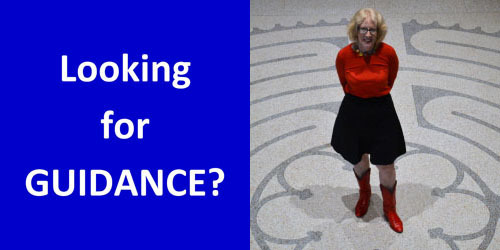 Another org that’s bringing art to everyone in so many ways is Hope Stone Dance – scroll below to see my PICK about a dance they are re-booting this weekend at the MATCH. I went to a staged reading at the Alley Theatre a few weeks ago that was part of their “Alley All New Reading Series”, and I am now noticing readings all over the city! It was a fascinating experience: seeing the work in progress was a unique peek into the playwright’s process. Here’s a round-up of upcoming readings that I found: The Next Iteration Ensemble is presenting their 4th annual “Intercultural Play Reading Series” from April 4-6; The Landing Theatre Company is presenting “Survivor’s Guilt” on April 22; and next up at the Alley Theatre is “Lightning” by Beth Henley on April 29. 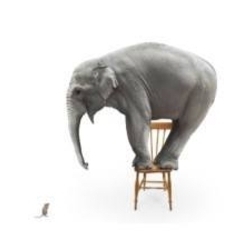 The Ensemble Theatre Company has a long list of special projects and staged readings (click here to see all); and Mildred's Umbrella Theatre Company also presents staged readings; their last one was “Diana of Dobson’s” last November. One last thought this week: if you’re sleepy but can’t run home for a snooze, check out the Nap Bar, located at the back of New Living in Rice Village. Naturally, Houston is one of only 5 places in the world to have public nap-houses. Shoot me an email if you try it out, I’m too busy to nap but might be convinced to give it a whirl! 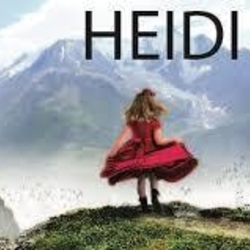 Be sure to catch the final shows of “Heidi” this Saturday, March 30 at 11am and 1:30pm, presented by the Company Onstage at their space inside Salem Evangelical Lutheran Church at 4930 W. Bellfort Street. This classic story of the Swiss miss we all love opens with Heidi happy in her mountain home, hanging out with her grandfather and his goat. But soon the unpleasant outside world intrudes and the two must figure out how to reunite. The Company Onstage has been run by volunteers since 1977. 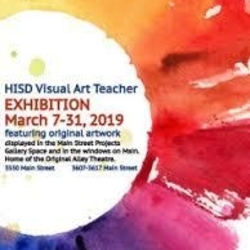 Because it just needs to be done, the Texas Art Asylum has mounted an exhibition to explore our fears and phobias – you know, like snakes, spiders, clowns, small spaces, needles, heights, dentists, bugs…and more. 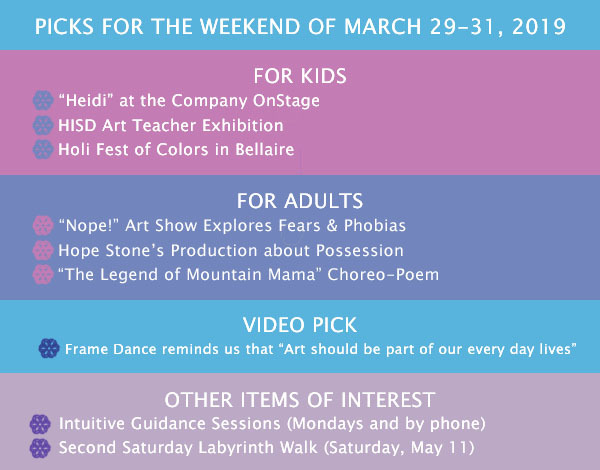 “Nope!” will be on view only two days: this Saturday, March 30 from 4-8pm and Sunday, March 31 from 1-5pm. If you’ve never been to the Asylum, you need to go! It’s part thrift store, part craft store and has a ton of cool stuff for creative reuse. 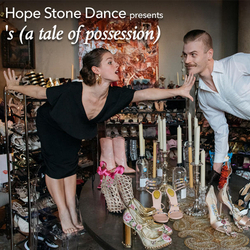 This Thursday, March 28 and Friday, March 29, Hope Stone Dance is bringing back ‘s (a tale of possession) – a show that addresses the timeless topic of ownership, questioning “what do we really own?” Hope Stone founder and dancer Jane Weiner created the piece in 2004 and restaged in 2006. Thirteen years later, time hasn’t changed our possessive natures – whether it's shoes or land or relationships. Be sure you don’t miss this show that features 10 dancers, 2,000 shoe boxes, 7 bird cages, a few teacups and finger sandwiches, a pedestal, and lots of shoes! 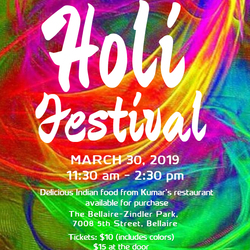 This Saturday, March 30, from 11:30am-2pm, come to the “First Annual Bellaire Holi Festival” at Bellaire-Zindler Park. This unique Indian “Festival of Colors” celebrates the Bellaire Indian community and the $10 tickets come with your own personal set of colors. DJ Riaz will provide music and Indian food will be available for purchase. There was another fun Holi Festival celebration last weekend and you can see more about that event here. Now you’ll have two to choose from every year! 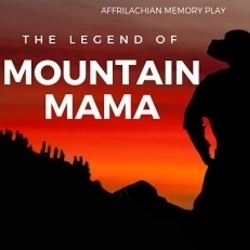 The Ensemble Theatre has a new alternative performance schedule called “Celebrating the Creative Journey” that features a mix of staged readings, master classes, and “The Legend of Mountain Mama,” onstage this Friday (3/29) through Sunday (3/31). This “choreo-poem” presents the voices of five Black women whom illuminate issues of environmental racism in the Appalachian region. The play focuses on creative survival, and the complex interconnection between people and place. Tickets are $10/each. 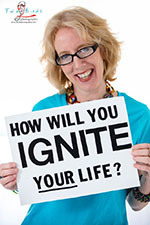 Join me on Saturday, May 11, from 10am-noon (NEW TIME!) for my monthly Second Saturday Labyrinth Walk at the beautiful Hines Center for Spirituality and Prayer in downtown Houston. We’ll tour the center, walk the labyrinth, and make art. I am a trained labyrinth facilitator and love sharing what I know with others! Register for the walk here or at the door. You’ll leave with your art, a list of Houston area labyrinths, and a handout on walking labyrinths. PLEASE NOTE: THERE WILL BE NO WALK IN APRIL.